This DVD introduces you to the best birdwatching sites in the Greek part of Cyprus and gives you a real ‘feel’ for what it’s like to go there. The best sites - covers all the best birding sites around Paphos, Polis, Akrotiri, Larnaca and Ayia Napa - including many important sites that you may not have heard of before. The best birds – sit back and enjoy footage of almost 70 species, including all the endemic species and sub-species and many migrants, including some rarities, all filmed using high-definition digital video cameras. 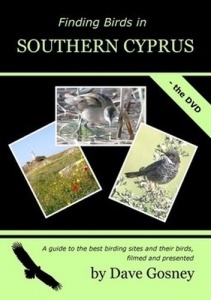 Join British birder, Dave Gosney, on his visit to Cyprus during the period of spring migration. You’ll see footage of the most exciting species, you’ll get an idea of what each of the sites is like and you’ll learn more about the island and its birds.